Download our 20-page whitepaper Download our 2-page flyer Request your free trial! 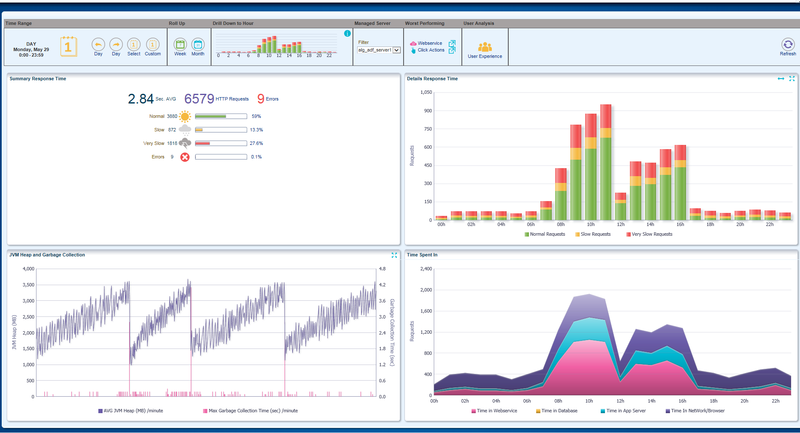 The dashboard gives a 24/7 overview of the performance in a selected time range. It shows real-time critical information about the ADF application’s performance. Monitor your service level agreement (SLA): What is the end-user experience? 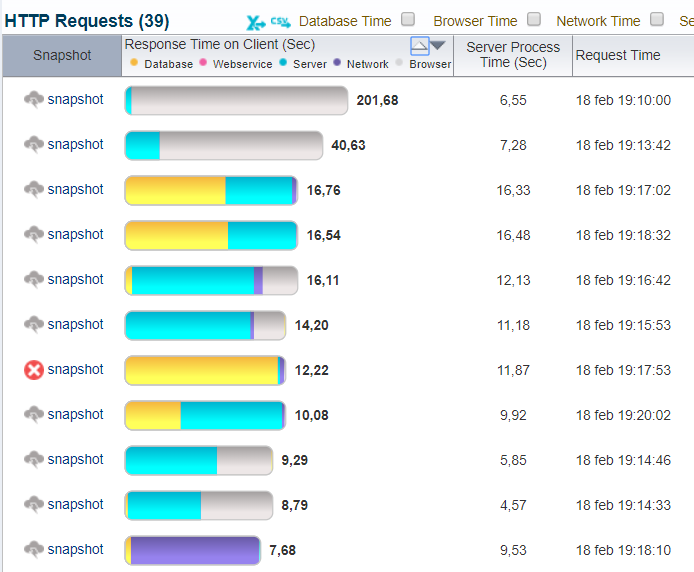 Are response times within SLA boundaries? Or are they well outside SLA boundaries and is it seriously problematic? What is the error rate? What is the health of the JVM memory? Is immediate action required? HTTP response times can be analyzed over the selected time range. This makes visible when the load is high (and how high), how the response times are distributed over the categories (very slow, slow and normal) and when there are performance problems (more red and yellow colored parts of the bars). When there is more red (and yellow) colored parts in the bar chart (top right) this should be a trigger to drill down to this hour for further analysis in order to find the root cause. Troubleshoot network problems. Network time is the time that it takes to send a HTTP request from a browser (http request network time) to the application server and from the application server back to the browser (http response network time). Read more here. 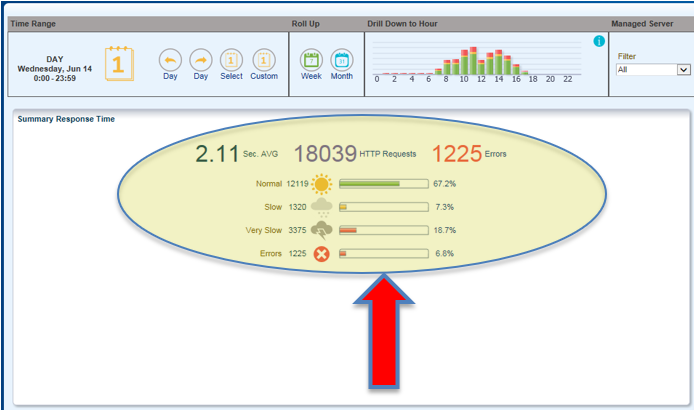 The dashboard shows several overview and detail graphs that shows the layer (database, webservice, application server, network/browser loadtime) where process time is spent of your ADF application. It traces key ADF actions across tiers and services to provide end-to-end visibility and automatically maps each tier to easily visualize the relationship between them. Browser load time on the end-user (client) side. This is the process time that a browser needs to build up the DOM tree and load the page. Detect pages that have a long browser load time. Read more in this blog article. An important aspect of performance management is a healthy JVM. The ADF Performance Monitor shows realtime or historic JVM heap usage and JVM garbage collection times. If garbage collections are running longer than a configurable threshold (for example 20 seconds) a warning sign is shown. This is often an indication of a problem – such as a freeze of all current requests because the JVM cannot clear enough memory. This should be a trigger to drill down to for further analysis in order to find the root cause. Insight in the number, type and severity of errors that happen in a test or production environment is crucial to resolve them, and to make a stable ADF application that is less error-prone. Application errors (and their stack traces) are often hard to retrieve or take a lot of time to find. Project teams commonly depend on the reports of end-users and testers, and they typically do not report all errors or provide insufficient information about them. Development, QA and operational teams can drill down to the error messages, their type, severity, and their stack traces to quickly troubleshoot errors and make the application more stable. Read more here. 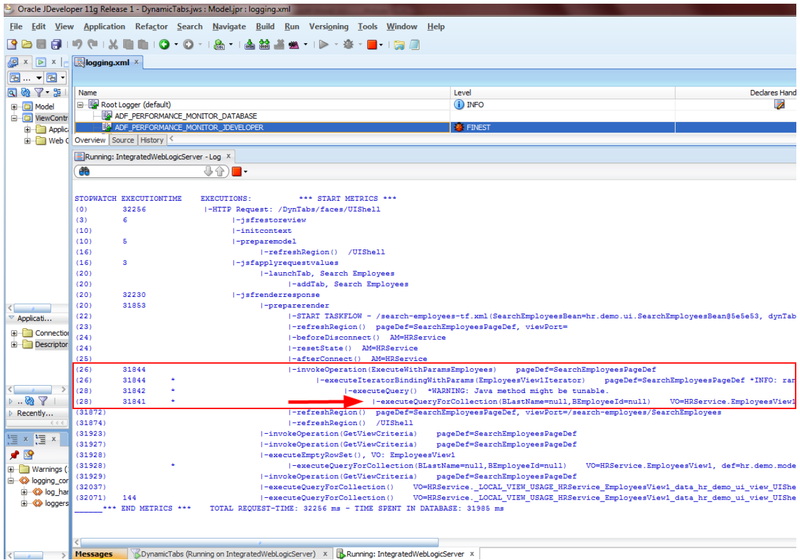 From the Errors overview you can drill down to the error stacktraces and their ADF callstack. This combination is unmissable to solve complex errors and their root cause. 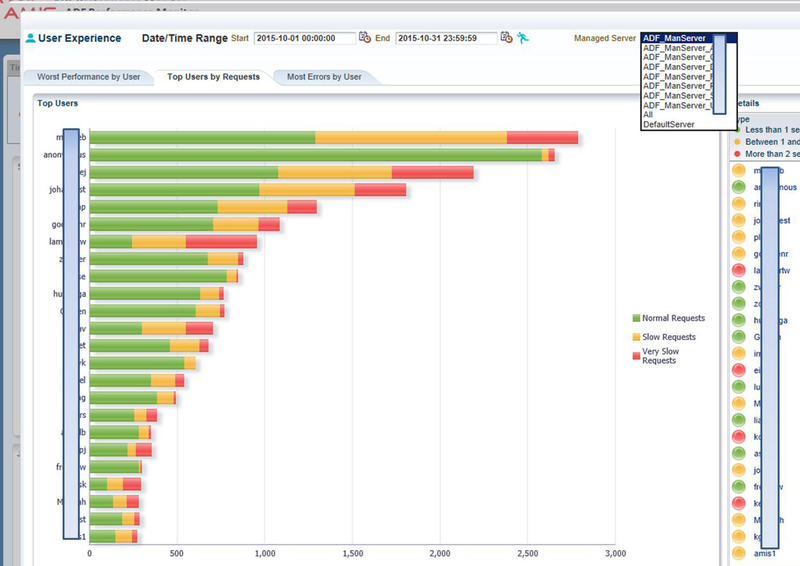 Time spent in webservice calls is shown on the main dashboard page. 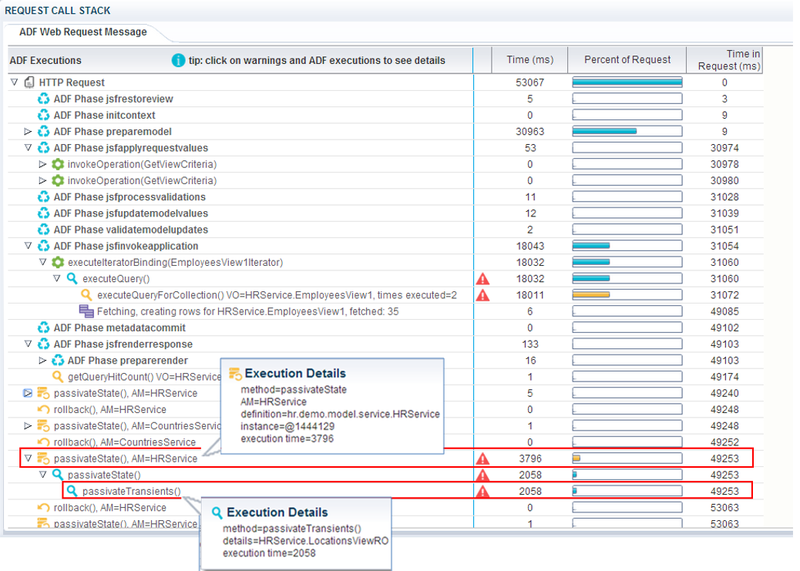 All webservice calls are instrumented and visible on the ADF callstacks. JAX-WS webservices, Apache CXF webservices and the ADF EMG XMLDataControl are supported. There is common functionality; in every page a time range can be selected (5 minute, hour, day, week, month). You can drill down or roll up to any time range, or navigate to next or previous time range. There is also an option for a custom time range; this is useful to evaluate load tests. An ADF callstack or snapshot gives visibility into which ADF method caused other methods to execute, organized by the sequence of their execution. A complete breakdown of the HTTP request is shown by actions in the ADF framework, with elapsed times and a view of what happened when. The parts of the ADF Request that consume a lot of time are highlighted and indicated with an alert/warning signal. A Click action is the actions that users have taken within the UI. This mostly relates to physical clicks on ADF Faces components such as buttons and tabs, but it also reports scrolling events, table and graph draws and more. It can help answer that particular question – “What did you do before you got the error?” for the operation/support team to troubleshoot problems. A threshold can be set to log ViewObject SQL queries and their complete runtime statement including applied ViewCriterias and bind parameter values. 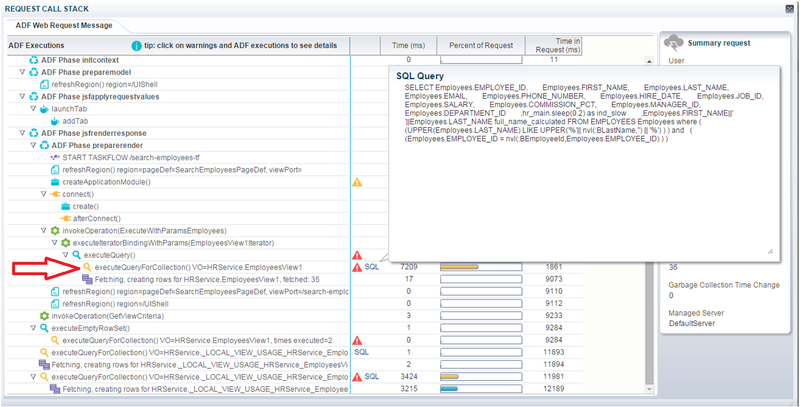 Analyze slow queries and problems executed against the database. During the whole application lifecycle, QA teams can make sure problems are found and dealt with. They can routinely check to ensure the application meets the desired quality. 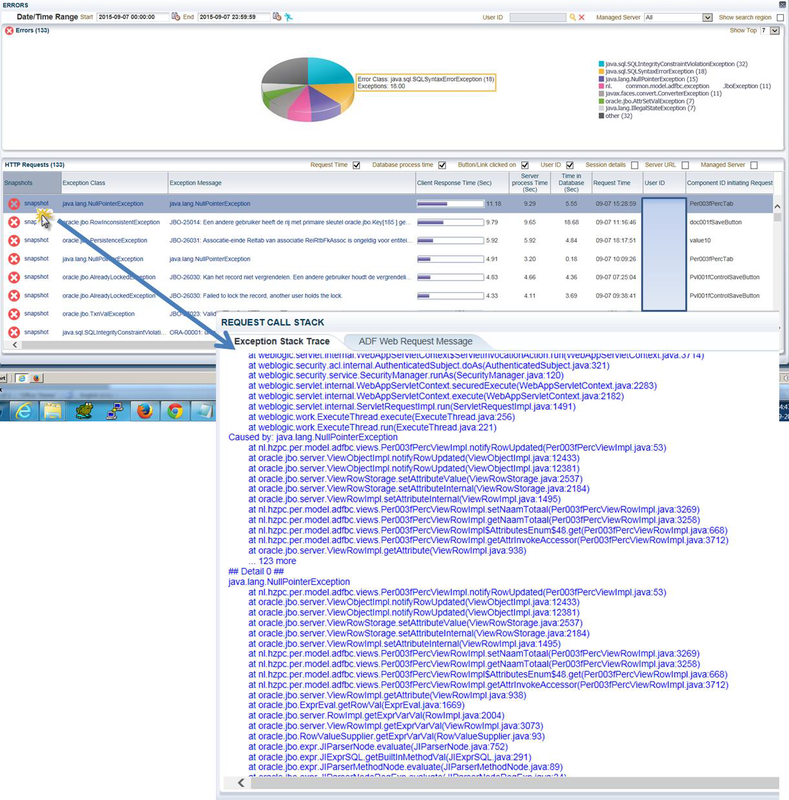 In the callstacks clickable warnings signs (Figure 11) are shown for slow executions and detected inefficiencies. These give a quick help with suggested solution(s) and a link to more detailed help. It is important to choose the right combination of ApplicationModule pooling parameter values to make the application scalable. This overview gives insight in the effect of these parameter values (how often passivations and activations happen, how long their AVG and total execution time is). QA teams can research and experiment with these parameter settings during load tests and evaluate the performance results in the monitor. The monitor also detects which ViewObjects data are being activated and passivated. The performance impact of frequent invoked executions can be much higher than executions that occur only a few times but are very slow on average. There are additional overviews for the total execution time. Like other web applications, ADF applications potentially use a lot of memory. 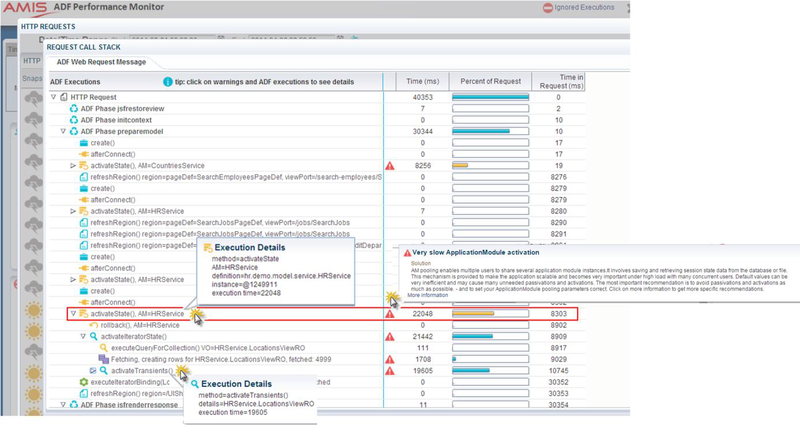 To prevent memory over-consumption (often a pain-point in ADF applications) the ADF BC Memory Analyzer detects how many database rows are fetched by ADF ViewObjects. When too many rows are loaded into memory a warning sign is shown with suggested solutions. Read more here. Drill down into a specific Managed Server. Compare performance between Managed Servers or Monitor All Together. There are several overviews of summarized end-user metrics. For example worst performance by user, top users by requests, and number of errors by users. In case specific end-users are complaining about today’s or yesterday’s performance, the monitor helps to quickly troubleshoot. With the monitor you can filter all requests and its details on a specific end-user ID and analyze/troubleshoot the problems. The true picture for every individual user is visible. Every user interaction (like clicks and scrolls) is logged. You can trace every session of your end-users experience. The ADF callstacks can be printed in JDeveloper during development. This enables developers to diagnose and solve performance problems at an early stage and to build an efficient, responsive ADF application before it goes into production. For every HTTP request a call stack is printed; a call stack provides visibility into which ADF methods caused other methods to be executed, organized by the sequence of their execution. A complete breakdown of the ADF request processing, including all ADF method executions, along with elapsed times is printed, organized by lifecycle phase.